When it comes to losing weight, it’s important to know the difference between healthy and unhealthy weight loss. 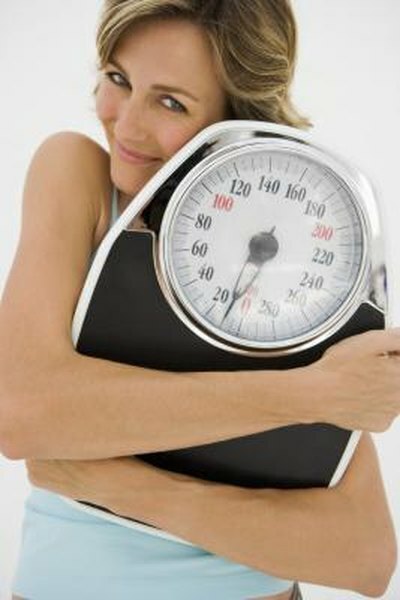 The Centers for Disease Control and Prevention (CDC) defines safe weight loss as 1 to 2 lb. per week. This is the ideal rate of weight loss you should average per week to allow your body ample time to adjust to the changes and to help you stick to your weight loss plan over the long term. Certified personal trainer Christian Finn says exercise alone will not produce significant weight loss results. He refers to several university studies on exercise versus weight loss, and in each case, the weight loss results were far below the CDC’s recommended average of 1 to 2 lb. per week; many showed results of less than 0.5 lb. per week. The type of exercise used in most of these studies was moderate aerobic activities, such as jogging or biking, up to four times weekly. Diet seems to play a more critical role in the weight loss equation than exercise. Cutting out a daily sugary snack cake and a 20 oz. bottle of soda can easily cut 500 calories a day. To burn 500 calories through exercise, a 155 lb. person would have to walk at 3.5 mph for nearly 2 hours, according to Harvard Medical School. Dieting alone can help people lose an average of nearly 1 lb. per week if they cut 500 calories from their daily diets per day. The most effective way to increase your average rate of weight loss is by combining exercise and diet. Eating healthier includes cutting back on sugar, salt and saturated fat. Eat more vegetables, fruits, whole grain foods, low-fat dairy, seeds/nuts/legumes and lean protein sources. To lose 2 lb. per week, you must eliminate 1,000 calories a day. Aim for cutting about 750 calories per day from your diet and get the remaining 250 calories burned by exercising at a moderate pace for 30 to 60 minutes each day. As you lose weight, you also need to consider the fact that your body requires fewer calories each day. If you were to maintain the same 2,000 calorie per day diet you had 20 lb. ago, you will find yourself slowly gaining that weight back. Use the U.S. Department of Agriculture’s free MyPyramid tool to find out how many calories your body needs each day to lose or maintain your current body weight. Also, consider increasing the intensity of your workout as you become more physically fit to ensure you don’t reach a fitness plateau.